Maneki-neko, literally means “beckoning” or "welcoming" cats in Japanese, also known as the Lucky Cat. It was born in the town of Edo (Tokyo) around the end of Edo-era (1603~1867). "Maneki-neko" has been loved by many Japanese people since the ancient times, as a good luck ornament that brings luck and prosperous business. The cats with their right paw up bring economic fortune and cats with their left paw up are said to bring in people (customers). However, by the time changing, it has been reflected of wishing luck to benefit on 'love', 'long life' and 'great hit on treasure lottery' etc. Especially into Heisei-era today, big pet boom made popularity of a cat lover and several kinds of Maneki-neko are produced. It is really popular for Japanese as they are believed to bring good fortune, invite happiness and bring prosperity to your home or on business. 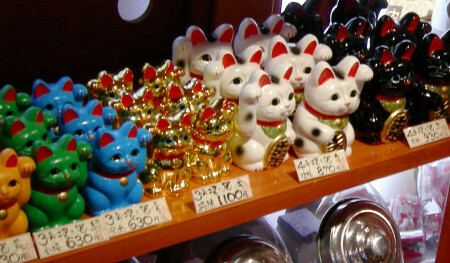 In Japan, Maneki-neko is usually placed at the entrance of houses and in store windows. 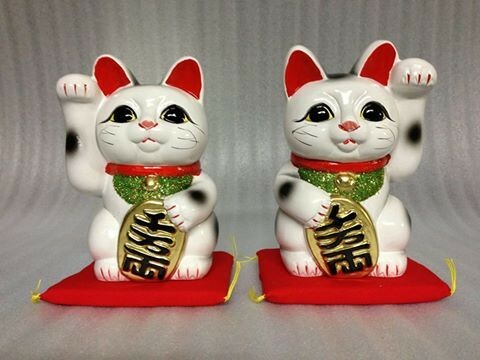 What does it mean when a Maneki-neko has its right paw or its left paw raised? What do the different cat colors mean? What about the coin the Lucky Cat holds, or the bib? Purple Cat : wisdom, knowledge, intuitive capabilities and self realization.